First Sentence: He was barefoot, in a white linen tunic and nothing else, as prescribed by Scripture. Reason for Reading: I felt I had put enough time between me and the last Ablow novel I read, which I had found disappointing. It was time to revisit the series and check another series off my catch-up list before the end of the year. Comments: One of the qualities I like most about Keith Ablow is his ability to humanize even the most disturbing of villains. It’s more than just an analysis of the characters from a psychosocial perspective. Ablow puts readers right into the characters minds. Likewise, the author does the same with his continuing characters, including forensic psychiatrist Frank Clevenger and his adopted son Billy. In The Architect, Billy and Frank’s personal side story mirrors in some respects the main plot in the story, that of West Crosse, a well-respected and highly desired architect. Crosse uses his talents to offer his clients a chance to restructure their lives in a way he believes is for the best, while at the same time taking lives to serve that same purpose. Meanwhile, Billy continues to struggle between doing what is right and going down the wrong path, and Frank must decide how best to handle it all. After reading Murder Suicide, I seriously gave some thought to discontinuing with this series, despite how much I like the way Frank Clevenger thinks and as well as his approach to his profession. 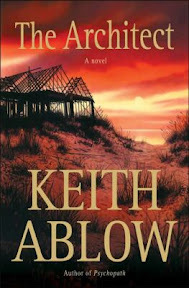 The Architect was worth reading and redeemed the series for me. Although I may not race out to read the next book in the series when it comes out in hardback (if there is to be one, that is), I do plan on visiting with Frank, North and hopefully Billy sometime in the future. Favorite Part: My favorite character in the book is probably West Crosse. He is not a character that inspires warm and fuzzy feelings, and I cannot say I particularly liked him nor in any way condoned his actions or agreed with his philosophy on life, however, I found him fascinating and thought the author did a great job of developing his character. I sure wouldn’t want to meet him in person! Miscellaneous: Today was my unit’s breakfast at Mimi’s Café for the holidays. We had a nice time. I ate way too much (and to top it off it, the office Morale Committee hosted a dessert afternoon! How dare they?!). I locked my keys in my car (thank goodness for AAA) and my skin is so dry because of the biting cold weather that my hands are cracking and bleeding. At least the day was mostly good. Happy Holidays incase I don't "see" you for a while! Haven't heard of this author before - sounds interesting. I'll have to check into this series. Lotus ~ Thank you, Lotus. I modified a friend's review format. I've been thinking about whether I want to tweak it a little for the new year. I hope you have a wonderful Holiday Season too! SuziQ ~ I always hesitate before recommending this series to anyone. It's got it's high points, but it always has it's low ones as well. There are better suspense/thriller series similar in topic out there.